"The annual meeting of the Kenosha Country Club was held at the clubhouse on Monday evening and the annual reports of the officers showed that the season now drawing to a close had been one of the most successful in the history of the club. Many new members have been added to the lists during the year and the greatest interest has been taken in the club events. The report of the treasurer of the club showed that there was a deficit of about $800 for the season but this total deficit was made up by popular subscription before the close of the meeting. The deficit was largely due to losses incurred through the operation of the dining room at the club and it is not an unexpected deficit. Members of the club realize that it is impossible to serve meals such as are served at the club with a profit. Considerable work has been done in adding to the club's property this year and all of these improvements are paid for. At the annual election of directors, Charles W. Allen, Charles Chester Allen, and Chester D. Barnes were elected to succeed themselves as members of the Board of Directors. While there are not more big tournaments scheduled for the season the links will be kept open until late in October. The recent rains have placed the greens and fair green in excellent condition and it is certain that the enthusiastic Kenosha golfers will keep the ball rolling until driven off the field by the early snows of winter. The election of officers for the new year will not take place until the regular winter meeting of the Board of Directions to be held next February." One of the finest sites for a golf course in the state of Wisconsin has been purchased by the Kenosha County club through the A.F. Stahl Agency of Kenosha, situated near the intersection of the Berryville Road with Sheridan Road between Racine and Kenosha. The purchase of the Kenosha County Club includes 175 acres of land and it is the intention of the club to erect on this land a magnificent clubhouse. The Lingies,Linstroth, and Benson farms make up the parcel of 175 acres, and the consideration, although not made public, should be in the neighborhood of $30,000.00. The situation of this land is nearly ideal for a country club. All roads approaching the place are improved, and the main road is a cement highway. The interurbanrailwaypasses right at hand. Should there ever be a movement to unit Racine and Kenosha golfers, this club is as easily accessible to Racine as to Kenosha. 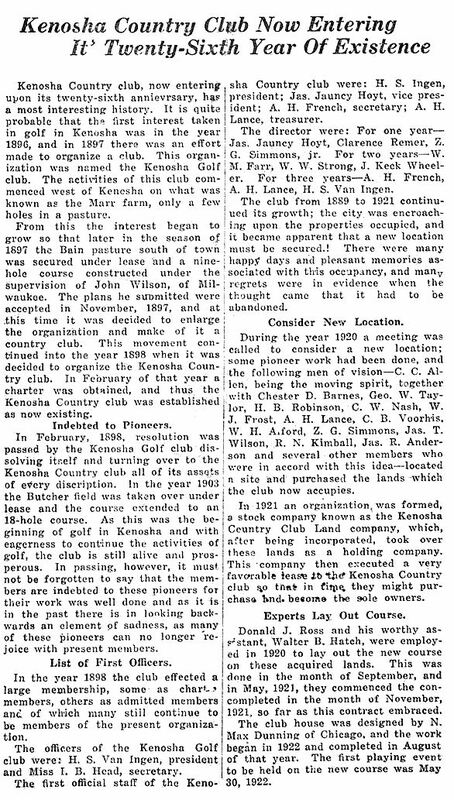 The Kenosha County club will continue in its present quarters for some time, but an effort will be made to get the new clubhouse and golf links ready for use in 1921. Contracts for the construction of the new golf course of the Kenosha Country Club have been let and the work of the construction is to start on March 15. The contract provides for the completion of the course by October 15. It is expected that close to $60,000 will be expended in the construction of the course and it is planned as one of the finest golf courses to be found in the middle west, members, say. The actual work of building the bunkers and the sand pits and laying out the greens is to be started on April 1. The seeding down of the new course will be done in August and it is expected that the course will be ready for play in May or June of 1922. Plans are now being made for the erection of a clubhouse, to cost $50,000, it is estimated. The plans has provisions for dining rooms, a large dance hall, and locker rooms. Click on the image below to see the complete 1924 Year Book.